Grew another year older and instantly reverted to an idiot. I was too caught up with watching a video on my laptop that when the bus I was riding from Melaka to Singapore pulled up at Johor Bahru’s Larkin bus station, I hurriedly got off, thinking it was immigration. On the upside though, I learned that even when you’ve lost your bus, there are alternative ways to go to your destination. Just relax and take it one step at a time… you’ll get there eventually with more stories to tell. My workstation in Mahabang Buhangin. Such is the life of a travel blogger. I was burning out from traveling last February and coupled with some money problems, I was ready to put off going to Kota Kinabalu. Up to the last minute, I was thinking whether I should still go. I’m glad I did because I had an awesome time — a serene boat ride along the river, gorgeous views (there was a cute Eastern European guy in the boat next to ours), great company (Hi Giselle!) and of course, seeing the unusual monkeys in their natural habitat. I honestly never thought I’d be able to visit this dream destination. Thanks to Seair and some awesome friends, we had a blast swimming, snorkeling and basically just lazing about in this gorgeous paradise. 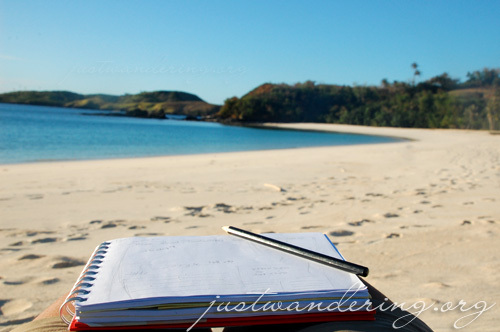 The Philippines is home to some of the best beaches in the world, and Mahabang Buhangin in Calaguas island is one of them. Imagine a long stretch of fine white sand beach with clear turquoise waters gently crashing on the shore and there are less than a dozen people to share it with. Heaven. Jumped without hesitation, but that doesn’t mean I wasn’t scared! Yeah, it’s not enough to just bungy, it has to be from the highest bungy! 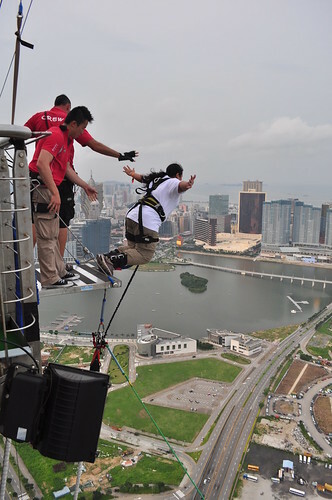 It wasn’t planned at all — I had this crazy idea of jumping when I got the invitation to tour from the Macau Government Tourism Office. The words “No refund” sealed the deal for me and I made my way to the 61st floor of the Macau Tower and jumped amidst all my paranoid thoughts. Vietnam is known to be every pedestrian’s hell with the thousands of motorcycles that zoom through the streets. I remember when I was just starting to plan trips in 2006 that Vietnam is one place that I won’t visit on my own because I’d be to scared to cross the streets. As every travel guide advice, just walk slowly and don’t step back. Much like life. I never really thought about going to Disneyland, because I always travel alone and theme parks are never fun when you’re alone. But thanks to Nuffnang, I was able to enjoy it (and the Disneyland Hotel) both with friends and on my own. I have to say, the Disney magic is really something else. I’ve always said it in this blog: I’m not friendly and terribly shy. As the blog grow though, so did I. Thanks to the people I met through blogging, I have grown more confident (a bit conceited at times, too), and I’m not as afraid to talk to people now. Go me! My goal for this year was simple: complete visiting the 10 ASEAN member countries before my 30th birthday. Yes, I cheated; it was supposed to be Southeast Asia, but I knew I won’t be able to do East Timor this year. Brunei and Myanmar were the last two in my list and I ticked them off just in time. It was a trip that almost never happened, but now I’m so glad I did — it was easily one of the best experience I’ve ever had. To all the people I’ve met and encountered during this last trip — Toni and family, Badong, Jim, Camille, Danielle, Kissman, Norli and Fateh — thank you. Your company was the best birthday present I can ever have. What a great year! Happy Birthday Nina! Bungy daw, sabi ni AJ Hackett lol Onga Mica, kelan kaya tayo magkakasabay uli? Disneyland is still the happiest place on earth! HAla nagulat ako perstaym mo.. Happy Bday te! God Bless you more! Loved your list. Happy birthday, Nina! “I’ve always said it in this blog: I’m not friendly and terribly shy.” — Sabi ko na nga ba eh, hahahaha! have an awesome year ahead!!! bravo! happy birthday nina! cheers to more trips! clap clap clap! ang dami mong na achieve! winner na ang pag bungy jump! dapat pala lagi na may no refund factor para wala ng atrasan hahaha!! thanks for the friendship teh tska sa mga pagchichismisan natinsa gtalk hahaha!! Haha thanks Dyan! See you in HK! Ah Pagan ! What a truly mystical place . Many fond memories . 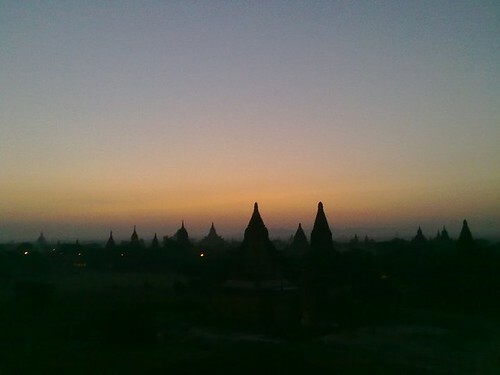 Burma was a completely different place when I was there in 1982 . Now that Aung San Suu Kyi is no longer under house arrest its about time to return . I hope so , we had 7 days to see as much as possible …and it was amazing ! Loved every second of it . The whole time in Burma cost US$10 lol . Bought a carton of 555 cigarettes and as bottle of Johnny Walker whiskey in Bangkok and sold it to the taxi driver upon arrival in Rangoon for Kyats , and that paid for the whole trip . Met some fantastic Burmese people and their families and have memories that will stay with me forever. “I’m not as afraid to talk to people now.” hehe Go Nina! Achievement yun! lol Thanks Flip! wow! completed ASEAN! good job nina!!! Thanks Jerik! Mukhang matagal pa bago ma-complete ang Southeast Asia! Am jealous with your life!!!!!!!!!!!!!!! Can I borrow it for a week please…. I’m doing good Kelan kayo mapapadpad uli ng Manila? What an awesome 29th year! Bilis, punta ka na rito! Hi Nina, thanks for dropping by! Been following your blog through e-mail for a while now, di lang ako maka comment, bawal browsing sa office eh haha. Anyways, I’ve met your friends during the awarding at the Canon office, bloggers din sila right? They even gave me a calling card. So envious of everything you’ve done before you turn 30. Galing! Keep it up!